Seth Leaf Pruzansky was born into this world with the ability to interpret deeply profound universal wisdom from his conscious awareness of reality. Throughout the course of his life he has learned how to masterfully articulate this knowing in a way that benefits those who are desperately looking for real answers to the big questions in life. His daily life consists of grounding the principles of natural laws, and higher awareness into small business structures. Welcome to the second installment of our Water Wars trilogy, featuring Seth Leaf Pruzansky of Tourmaline Springs. In this episode, our guest delivers a profoundly spiritual, yet practical point of view of water, one of natures greatest gifts to all life on earth. Have you ever wondered what water is, where it comes from, and why it's so crucial to our survival? Are you aware that your body and brain are mostly water? If we are made primarily of water, then wouldn't it stand to reason that our top health priority should be learning everything we can about this substance, and how to find the best possible source? When it comes to the water we drink and bathe in, there are thousands of choices, and most of them come with considerable health risks. Tap water is subject to endless sources of toxic contamination, despite the various forms of filtration available, and much of the bottled water on the market comes with challenges of its own - which in most cases puts it in the same lower class of safety as tap water, not to mention limitations of sustainability and adverse environmental impact. After over a decade of personal research and development, I have chosen almost exclusively to drink genuinely natural, wild, unadulterated spring water. However, in recent months there have been thousands of web articles and television reports about the supposed 'dangers' of people drinking such water. The vast majority of reports have positioned the practice of drinking unprocessed spring water as a 'new, dangerous trend' as if humans have not managed to survive on the planet for the past two million years drinking it. In light of much recent fake news propaganda put forth by the mainstream media, I've taken it upon myself to tell the other side of the story about what I believe to be nature's most significant, and mysterious gift to all life on earth. It can be argued, that after oxygen, water is in fact, the root of all life. When I set out to provide listeners of the show with a comprehensive guide to all things water, I had to track down Seth Leaf Pruzansky. 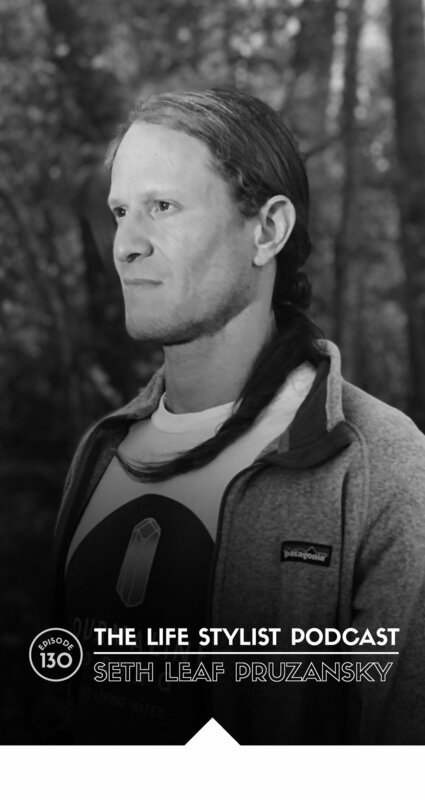 Seth is one of America's most committed advocates for consuming natural spring water, using his company Tourmaline Springs as a vehicle by which to share his love of water with the very fortunate residents of the East Coast. In this episode, Seth is going to do nothing short of blowing your mind with his vast and intimate knowledge of this mysterious liquid we call water. Please do someone you love a favor by sharing this profoundly impactful podcast with them. Now more than ever, we humans need to claim our divine birthright to drink water as nature intended it. ORGANIFI. I'm loving Organifi Gold especially for my night time routine. It has turmeric, ginger, reishi, lemon balm, turkey tail and other rad super foods, phytonutrients & pain-soothing herbs. My daily routine lately goes like this: in the morning I add it to my nut milk smoothy. At night when I want to chill out, I make a golden latte. I add the power and a healthy fat like ghee, coconut, or grass-fed butter to hot water and voilá! Great warm elixir, really chills you out, gently detoxifies and tastes awesome. Save 20% off, use coupon code "LIFESTYLIST"
Athletic Greens. 11 supplements in 1! As someone who’s been into superfoods, and supplementation for over 25 years, I’ve seen many a trend come and go. One of those trends is green powder blends. Having tried many of them, and left most of them behind, one I’ve decided to stick with is Athletic Greens. The attention to detail in the ingredient deck and the careful sourcing of those ingredients is really impressive. The inclusion of not only the broad spectrum of vitamins and minerals is fantastic, but also the enzymes and probiotics necessary to fully assimilate those nutrients. Add to that the convenience factor, and the elimination of the need to travel with 20 bottles of supplements, and you’ve got a home run even for the most discerning health connoisseur. If you’re looking for fast acting energy, alkalinity, and nutrient density, Athletic Greens is a home run. Get 20 FREE travel packs valued at $99 with your first purchase.